Steel pin, preferably made of 1.2343 material and hardened, usually cylindrical (with a cylindrical or conical head), used for the ejection of castings from gravity dies, pressure dies and core boxes. 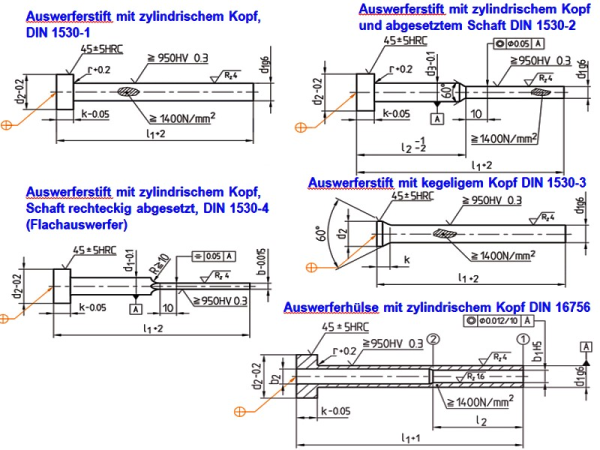 Cylindrical ejector pins with a cylindrical head are standardized in DIN ISO 6751 (DIN 1530-1) and cylindrical pins with a conical head in DIN 1530-3. An overview of types of ejector pins can be found in Fig. 1. The ejector pins used for cores can be divided into blind and contour ejector pins. Blind ejector pins cause a core box to open by pressing against its opposite parting surface upon hardening of the core material. 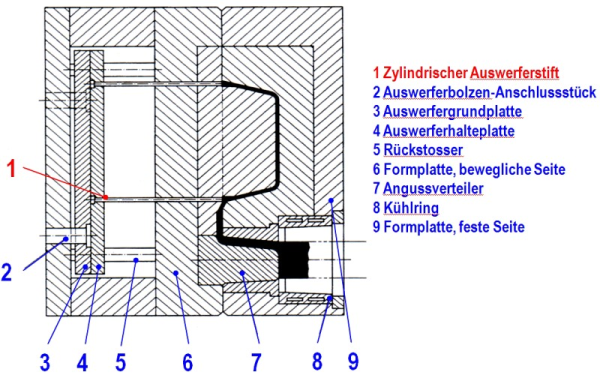 In the retracted condition, these ejectors must be recessed from the parting surface by about 0.2mm to ensure that the core box parting plane closes tightly when the two halves are combined. Contour ejector pins need to be flush with the core box contour and can neither protrude from the contour nor be recessed from it. Hollow ejector pins are called ejector sleeves. In die casting tools, cylindrical ejector pins with a cylindrical head made of hardened and nitrated 1.2343 material are usually used.